SYDNEY, AUS. - Not one but two hat tricks. That's what the Eagles Sevens recorded when they defeated rival-Canada 36-14 in the final match of Pool B at HSBC Sydney Sevens 2019. The team most notably on form played a competitive battle against the Canadians. Remaining diligent on defense, the United States worked their attacking game from all sides of the pitch as Carlin Isles and Kevon Williams combined for six tries in the USA victory. A tight win over France and a monstrous defeat of Kenya preceded the final win of pool play, where Head Coach Mike Friday and the Eagles Sevens cemented their place in the Cup Quarterfinals with Spain. "We are pleased with our day's work in what was an awkward group for us to navigate through today," said Friday. "That first game against France in those conditions meant we had to be resilient in defense. I was very pleased with the defensive discipline as it was not going to be a game where attack could shine. "As the pitch dried out and the weather improved it meant we were able to get our attacking game going and our ability to control the restart element of the game both sides of the ball gave us a platform. "We need to get our bodies recovered and ready for Day Two as that is what it's all about and we have a very tough game against a very competent Spain team." Canada opened the match with a strong showing, getting within five meters of the tryline on the opening play. 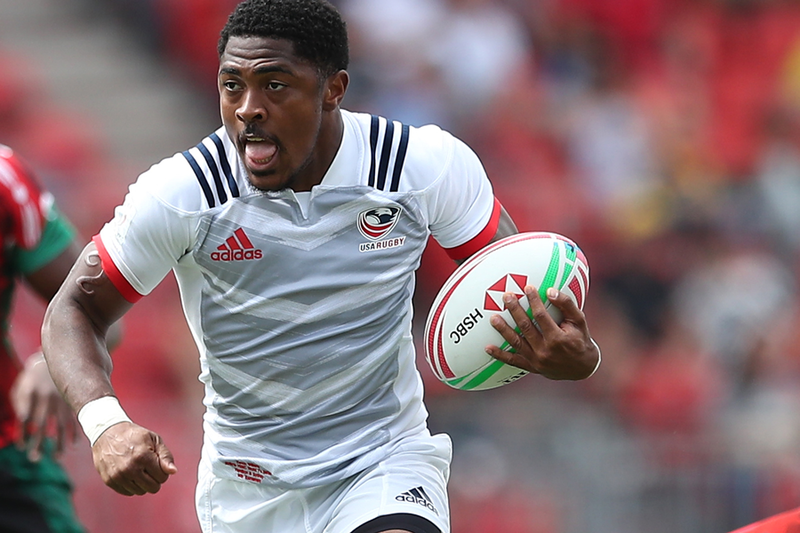 But the USA defense held strong; and when Canadian Nathan Hirayama drew a yellow card, the Eagles Sevens had the advantage to chase momentum. When Canada knocked the ball on at the breakdown, the Americans got on the board quickly. Carlin Isles ran the outside route to score a classic try in the corner 5-0. Back from the sin bin, Canadian Hirayama almost ran away with the next attack. But, with Danny Barrett chasing him down, Hirayama made a grubber kick that fell outside the touchline giving USA back the ball. In favor of possession, Martin Iosefo broke the gain line and tossed a pass to Kevon Williams who ran his first into the zone. The Eagles Sevens' next try came off a perfect passing relay where Iosefo tipped the ball to Williams and Folau Niua pushed it to Danny Barrett for Carlin Isles to again swoop in and dot down, 17-0. In the second half, Brett Thompson made it inside the 22, after which Captian Madison Hughes made a long pass to the left where Kevon Williams caught it and ran straight for the tryline, 22-0. With some space and despite the USA defense making it difficult, Canada scored two back-to-back tries, enticing fans with the hint of a comeback at 22-14. But before the Canadians could get away with another, Carlin Isles made quick work of the hat trick and scored his 150th USA try to make it 29-0. And with a brilliant finish, Isles was pushed out of the zone on incoming defense and made an impressive hurdle over the sponsor backboard. In the end it, was Kevon Williams who had the last word. Williams caught the Canadians off guard and easily ran a long route to claim his first hat trick of the season, 34-0. With a perfect record in pool play, the United States will next face Spain in the Cup Quarterfinals at 9:22 PM ET, LIVE on watch.espnplus.com.